Upright, medium vigor plant, suitable for trellissed cultivation. 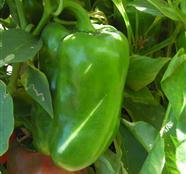 The 9 cm wide, 14 cm long fruits, are shiny green in color, and turn red at full maturity. With 4 to 5 mm wall thickness, this variety is a good shipper. Lama F1 produces a high percent of four-lobed fruits throughout the growing season.